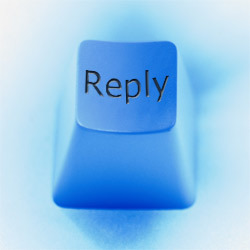 The question whether to reply or not is one answered by your commitment, your involvement and perhaps your attitude. The short answer is ‘Yes’, you should reply. Imagine, if you will, the phone rings, it’s a client, you delivered a rapport and the client just calls you up to thank you for the work.., what do you do? A) You hang up the phone without saying anything? B) You offer a reply? I bet you chose B. Of course you reply, it is rude to just hang up. Plus, chances are you just lost a client unless you have a pretty good explanation on why you hung up. Comments on blogposts are surprisingly similar to conversations, be that over the phone or in person. Why are they surprisingly similar? Because comments on blogposts are conversations. When I read a blogpost and I like it, or I feel I can add something to the conversation.., I leave a comment. Sometimes this is merely a compliment, sometimes I put a lot of thought into it. Especially when the writer asks for an opinion at the end of the post (and I have one to share). When the author does not reply, it shows lack of interest and to me even lack of respect. Sure, some blogposts receive an astounding amount of comments, and replying to all these posts is just not possible, but at least pick out the best ones. Leave a reply or a thank you on those. At least it shows the rest of the commenteers that you are there. With over 50 or 100 comments your visitors will understand you can’t reply to all, especially if it’s merely a thumbs up. Replying goes beyond the blogpost too. Ever since the Internet turned social the whole network has become one giant conversation. Social has brought humanity to an otherwise static Internet. And the conversation is right at the hart of this. Even if it is just a Like or a Retweet, the power of the conversation should never be underestimated. Do you reply to every comment, tweet, like or whistle? Next Next post: How Do You Convert The Unconvertible?